Santo Domingo de Guzmán is the capital of the Dominican Republic and also the greatest city of the island, situated at the southcoast with one of the most important harbor named Haina. 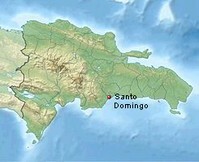 Also Santo Domingo is the residence of an archbishop. Founded in 1496 by Bartolomé, the brother of Cristof Columbus is this one of the oldest cities, constructed from europeans in the new world. The oldest cathedral of America (laying of the foundation stone 1521, inaugurated 1540) disclosed the remains of Columbus. In 1992 occasioned by the 500 anniversary of the discovery of America they moved the remains to the new Faro de Colón. 1538 they inaugurated the first university of America. The historical part of the town named Zona Colonial is since 1990 cultural heritage. This colonial palace, constructed in the first time of the 16 century, ist the unique construction which was a property of the Columbus family and today it is one of the most visited museum of the city. The furnitures, equipments and clothings from the colonial time you can inspect them there. In the colonial era the son of Cristof Columbus, named Diego Columbus, was living in the palace in his regency period..